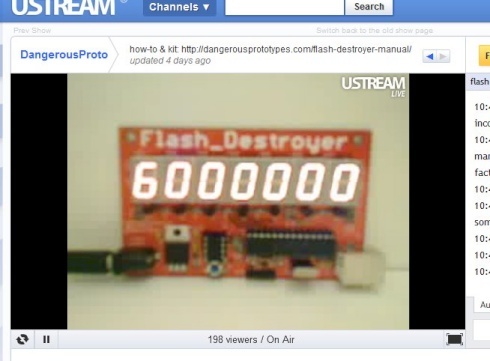 James managed to catch a screenshot of the Flash Destroyer as it hit 6,000,000, thanks James! The EEPROM is specified for 1 million writes at the voltage and temperature extremes listed in the datasheet. Running at room temperature, this chip might surpass 10 million write cycles. Or not. Stay tuned and find out. Submit your final count guess to win free PCBs. This entry was posted on Wednesday, June 2nd, 2010 at 8:00 pm	and is filed under Flash Destroyer. You can follow any responses to this entry through the RSS 2.0 feed. You can skip to the end and leave a response. Pinging is currently not allowed. Damn, it’s like a *machine* !